Monday was a very low-key day. I went to a Barnes and Noble to work on my novel. Overall, I felt like I had a good writing day. Plus, I finished my night with Castle, which is always fun. Today, I went back to The Town Where I Used to Live. It wasn’t a long visit, but I was there long enough to realize that there were subtle changes to the town. It felt familiar and weird all at the same time. In this Town Where I Used To Live, there were good times and bad times. For the longest time, I could only remember the bad times. But as I went around the town, I remembered that this was where I began writing my novel. Or at least where my dream of writing a novel began. I learned today that if I never experienced the bad times, I wouldn’t have as much writing fuel or may not have had any writing fuel whatsoever. If Buffy taught me anything, it was that even when the drama hurt, it was necessary to move the story forward. And as long as the audience is entertained and left wanting more or at least satisfied, it’s okay. It’s basically the healthiest form of sadomasochism a human being can endure, really. Right now, I’m approaching the end of my poem-a-day challenge at Writer’s Digest. I found that the poems that my most personal poems were the ones I got the most comments on. I wrote about having a haircut last year, having insomnia, being hurt numerous times, following the yellow brick road, personal loss, rain, and being alone. It fascinated me that the poems that revolved around my pain had comments. I think it goes beyond the stereotype of the tortured artist/poet, though. I think everyone has felt pain at some point and when someone puts that pain in words, it establishes a connection. I write to help myself connect with other people. I’m gonna write about what else happened today tomorrow, as part of my overall recap of my adventures in California. 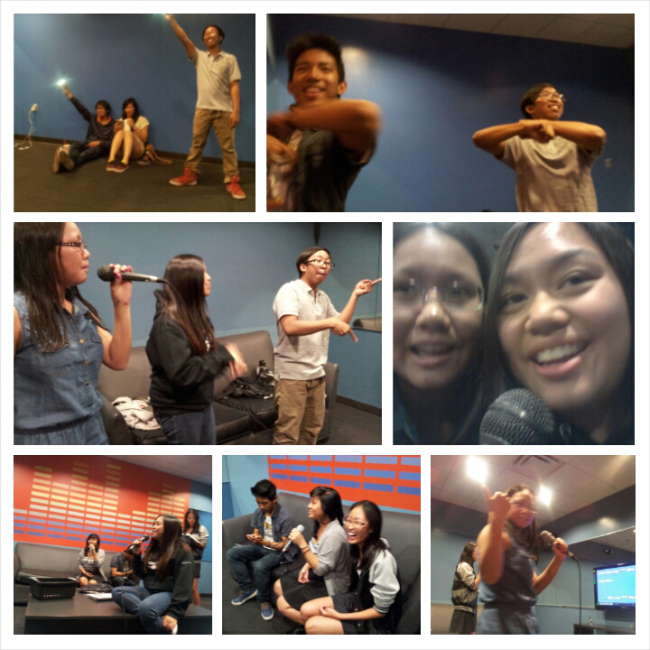 Saturday and Sunday were jam-packed with a lot of awesome, wonderful events. Saturday was the day of my cousin Di’s 18th birthday party. I got dressed up to the nines and danced the night away. I ate sirloin for the first time. It was really good, all things considered. The best part was making funny faces in the photobooth, both by myself and with my cousins. At the end of the party, my uncle announced that there would be a huge family reunion the next day. But I had other plans. On Sunday, I went out to Alhambra, where I attended a Papal Party, also known as a celebration of the canonizations of Popes John Paul II and John XXIII. (Fun fact: The canonization took place at around 12-1AM Cali time so as soon as the party was over, I turned on my computer and fell asleep watching it.) 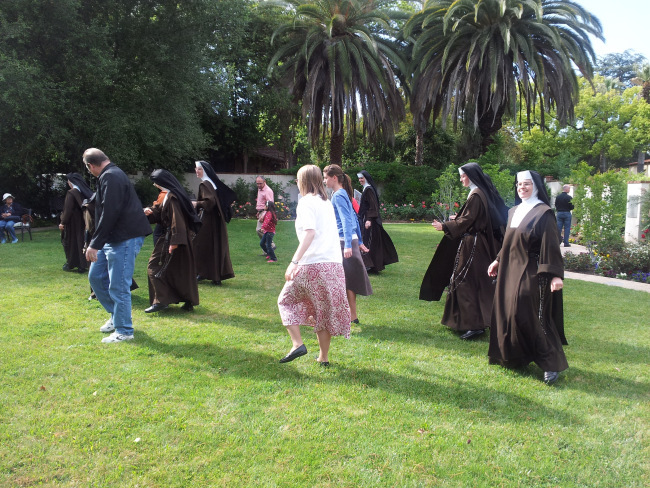 The party was hosted by the Carmelite Sisters of the Sacred Heart. They were all wonderful. There was a church nearby, so I was able to fulfill my obligation of going to Mass that day. 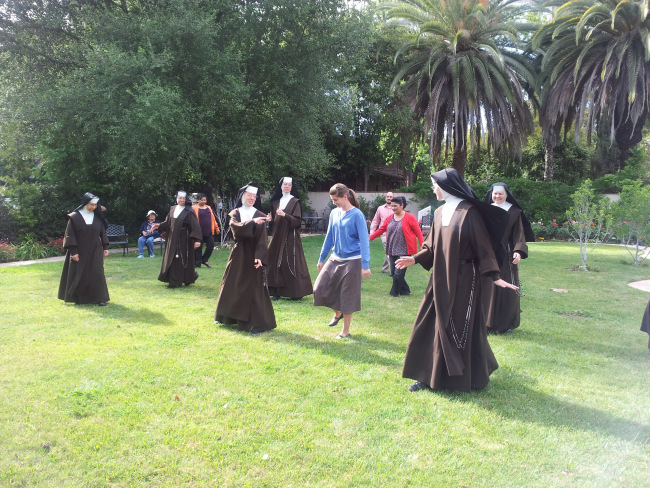 It was founded in 1924 by Discalced Carmelite Friars from Ireland and at the time, St. Therese was just Blessed. It’s the first church in America dedicated to St. Therese, or so one of the sisters told me. Although I didn’t get to know the sisters as much as I wanted to, just meeting them was a wonderful privilege that I’ll never forget. 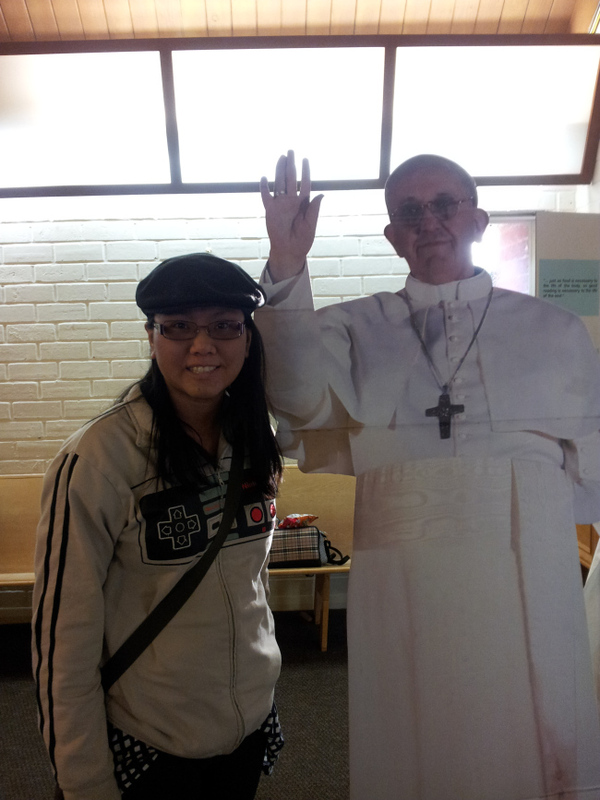 Plus, I got to take a selfie with Pope Francis! 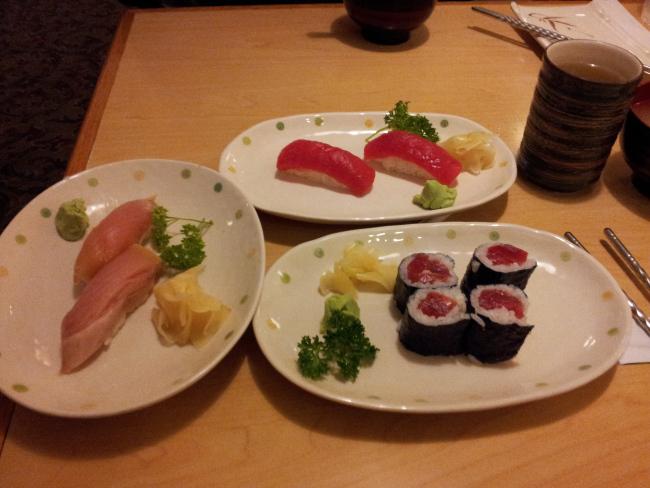 After the party, I went out and got sushi for dinner. Overall, I had an awesome weekend. Today was a little more low-key than yesterday. I wore earrings for the first time in forever. (I had to get them re-pierced and I just took my earrings off.) It felt really weird, but I liked how they looked. But, like the nails, they are definitely not something I want to wear all the time. 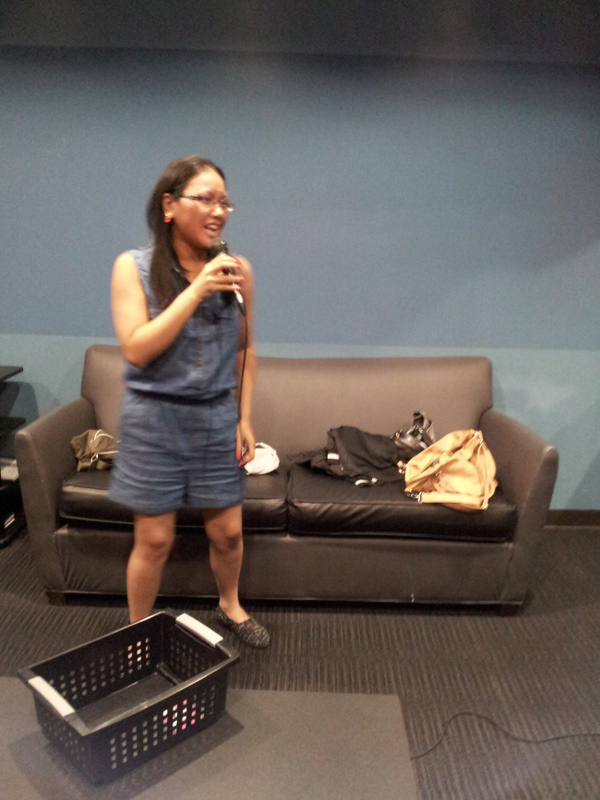 It was so much fun singing karaoke in a place other than the usual Filipino family reunion. Di and her friends were hilarious! 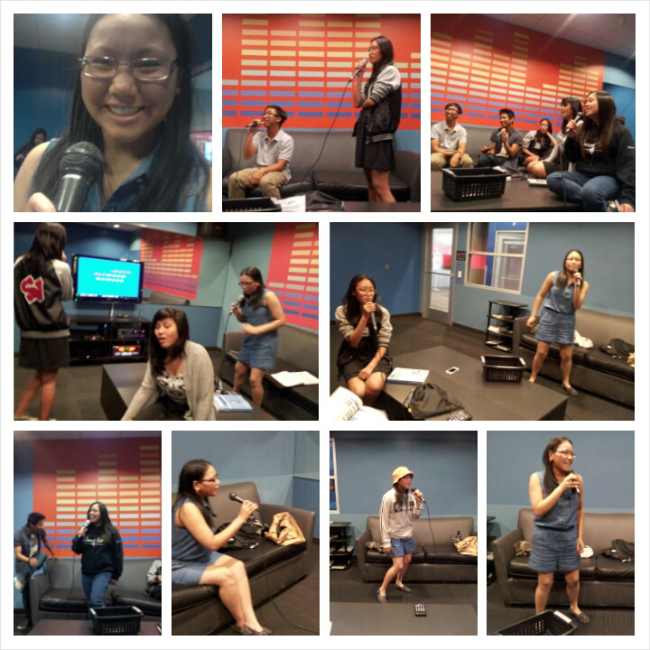 Here are some grid photos featuring the highlights of the hour-long karaoke-rama. Now on a scale on 1-10, how 90s is my outfit? So if you can’t guess from the title, I am travelling! I am spending a week in sunny California as sort of an Easter vacation. So why the title? Because I was reading Eat, Pray, Love on the flight to Los Angeles. 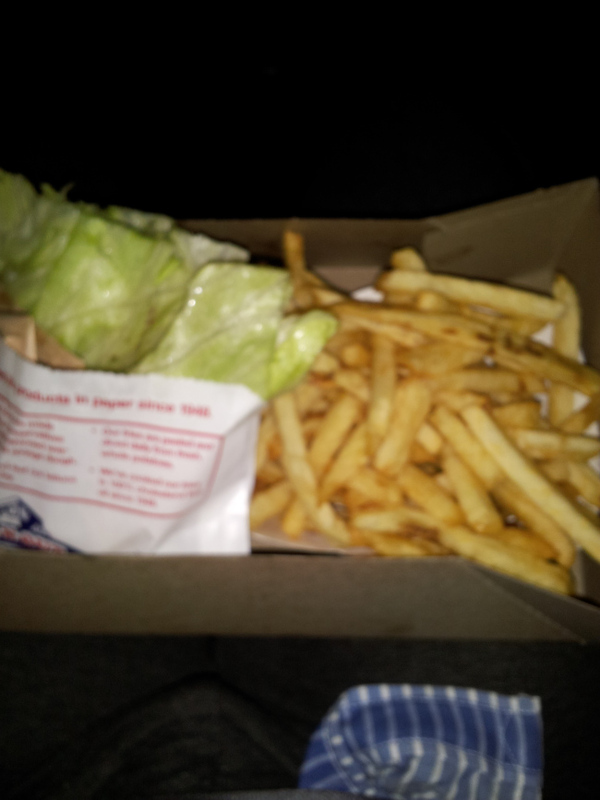 The first thing I ate was a burger from In-N-Out, wrapped in lettuce, with a side of fries. 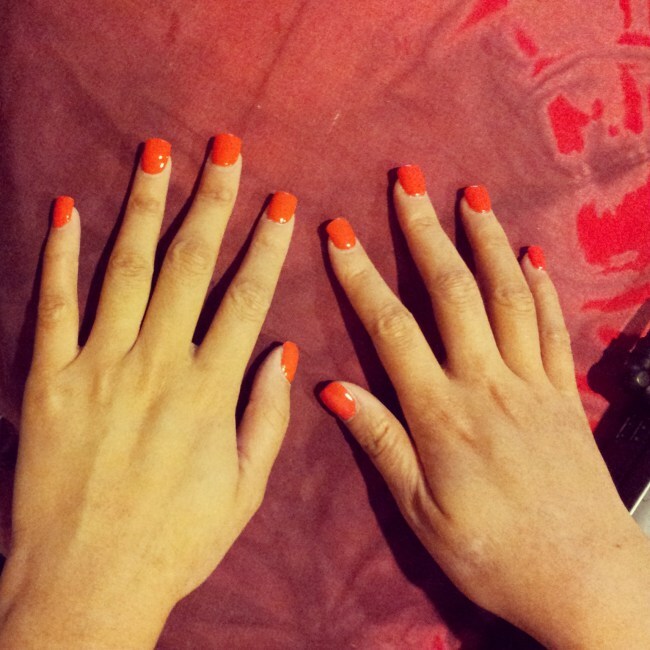 Today, I got my first manicure. Being at a mall was actually a lot of fun. I got to know Di’s friends, Annie and Rocky, along with half a dozen others. 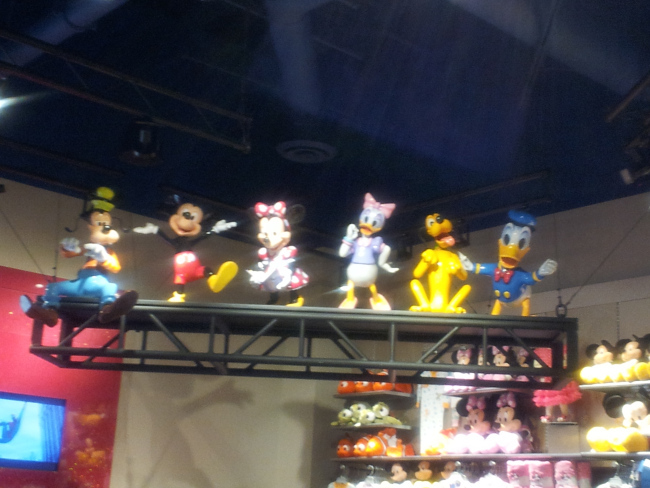 I found a Disney Store there, which was seriously awesome since the one at my local mall closed down. Even though Di and her friends were younger than me, I got along with them well. I was able to make small talk easily, which is a big deal considering that I have autism. After exploring the local mall, I went with Di and her friends to the local boba (SoCal speak for bubble tea) place. Di explained that back where I come from, the boba was pretty average. The place I went to was small, but they had a lot of good choices. 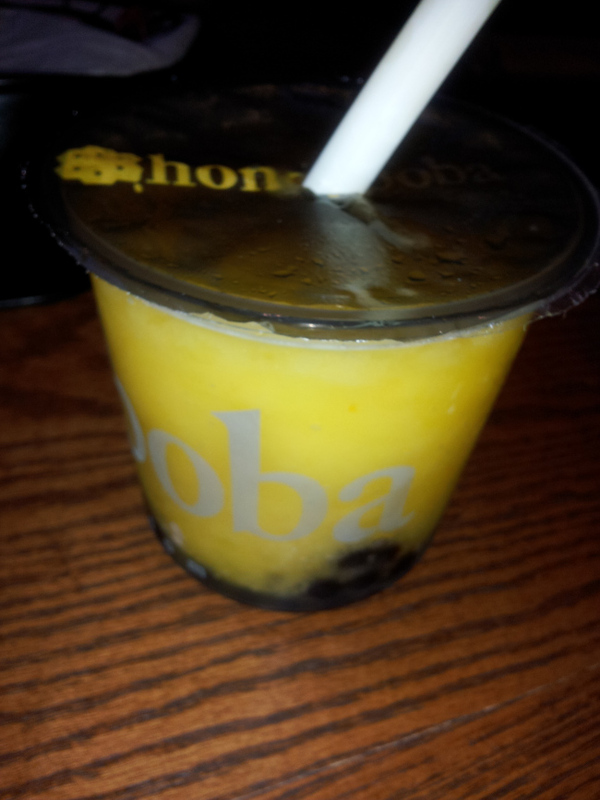 I went with my tried-and-true favorite, a mango slushee with tapioca. I feel like I’m 17 again. So Lent didn’t turn out the way I thought it would be. There were a lot of struggles, but also a lot of lessons learned along the way. The wonderful thing about Easter is that it’s a time of celebration and redemption, to remember that death isn’t the end-all, be-all. At Mass, Catholics renew their baptismal vows. It reminds us of what we chose to believe in and what we are all striving for. To make a long blog post short, I know I should’ve done better in my daily updates. But I am happy with what I did write. And there will be more writing to come for this blog in the future. During Lent, I learned a lot about humility and patience and during Easter, I will put what I learned to practice. Sneak preview: I will be doing a series of posts called “Eat, Pray, Love: The Catholic Version.” Watch the trailer for the movie and you’ll get a hint as to why I’m going to do this. I will tell you right now that I’m not gonna go to Italy or India or Bali. Come back to this blog Thursday and join me on my journey. Interesting connection b/w Matthew’s family tree and The Hitchhiker’s Guide to the Galaxy…Matthew mentions the number 14 three times to represent the number of generations b/w Abraham and David, David to the Babylonian Exile, and the Exile to the birth of Our Lord. 14 generations pass in between these 3 huge events in Hebrew history…14×3=42. So why am I talking about Christmas so early in the year? Because you can’t have Christmas without Easter. And vice versa. During this season of Lent, we look for hope within the desert, waiting for the rain to come and make the flowers bloom. Even when the worst of humanity shows itself, the best of humanity rises out of the ashes and shows the world that there is good. I don’t know where this came from, but I heard it said that a life is defined by the line between the year of your birth and the year of your death. What’s unique about Jesus was that he was literally born to die. But the good news is that death isn’t the end of the story. To quote one of my favorite songs: “Every new beginning comes from some other beginning’s end.” Christ’s life began and ended…but three days later, there’s a new beginning. It’s no coincidence that Passover and Holy Week take place around the same time. Jesus celebrated the Passover meal with his apostles the night before his death, after all. But what if I told you that there was another connection between Passover of this year and the day that Jesus died? But this documentary also shows something else: what the sky looked like (astronomically speaking) on the day that Jesus died. It’s revealed that on the day Jesus died, a lunar eclipse occurred. A lunar eclipse occurring shortly after the start of Passover. The blood of the lamb washing over a pure white surface. Sounds familiar. God’s timing can be seriously uncanny sometimes. A word of advice from experience. As much as I loved listening to my local Christian Music radio station, the occasional advertisement was always Easter-centric or said the words “He is Risen!” while I shouted: NOT YET! Sorry, Christian Radio, but you’re kind of jumping the gun along with the rest of America here. The purpose of Lent is to remember the Passion and death of Jesus first. Catholics celebrate Easter for 50 days. There is plenty of time to celebrate, but now’s not the time. It’s like opening Christmas presents a week early! With that in mind, I’m going to recommend some music to listen to during this week. Today, I want y’all to check out a woman named Audrey Assad and her album Fortunate Fall. Patheos blogger Marc Barnes wrote what I think is the best recommendation for this album. But given that I’m also an Audrey Assad fan, I’m gonna give my two cents. This album captures so much of what Lent is and what Lent centers on. The first track recalls the Exsultet, an ancient chant sung during the Easter Vigil. Ever heard of the term “Felix Culpa?” That’s Latin for “fortunate fall.” “O happy fault that gained for us so great a redeemer.” The sin of Adam led to Christ redeeming mankind as a whole, which is reflected upon in the Easter Vigil’s readings. The second track is “Help My Unbelief.” Taking inspiration from Mark 9:24 and Doubting Thomas’s revelation, the song reflects the mindset of spiritual dryness. In this song, the person is making an effort to be faithful, but is suffering some kind of trial. How often we forget to ask the Lord for His help when we are down. “Humble” is a song of praise to Jesus for becoming human. So many songs in Christian music speak so much of Jesus’s divinity. How many songs acknowledge His humanity? The song also asks those listening to follow in John the Baptist’s example, to let themselves decrease so that Christ can increase. “O Happy Fault” is an interlude but worth listening to for the instrumentals and the echos of “Felix Culpa.” It’s almost meditative, recalling the Easter Vigil with gratitude and gravitas. “Lead Me On” takes inspiration from the uber-famous Psalm 23. Although it’s a structured song (in the whole verse-chorus-verse sense), it continues the theme of gratitude grounded in humility. It’s beautiful in its simplicity, with the imagery of the psalm actually working with the subtle glow of the song. Mark Barnes sings this song’s praises better than I can, tho, so read his article linked above, please! “I Shall Not Want” takes inspiration from a Catholic prayer called The Litany of Humility. It’s also structured in a verse-chorus-verse style, but the song is carried with just piano, stringed instruments, and backup vocals. Again, there is beauty within the simplicity of this song, which cries out with desire of deliverance from everything the world values most. “Good to Me” is a song of praise within hard times. Happiness that is surrounded by hardships. More “spiritually high” than “Help My Unbelief,” it recalls some familiar biblical phrases from the Psalms and the Song of Solomon. It captures a martyr’s hope in such a beautiful way. “Felix Culpa” is another instrumental interlude. It repeats the earlier “O Happy Fault,” but takes on a more joyful tone, like a sunrise on Easter Morning. “Lead Kindly Light” is based on a prayer by Cardinal Newman. It’s a prayer of a lost soul trying to find home again. It can also be about a person trying to find his path to whatever God is calling him to do. It’s the story of a journey, of a walk taken in faith and not by sight. The piano and soft vocals reflect the tone of the words. It’s not a grand gesture, like “Amazing Grace,” but instead a quiet acquiescence to God’s will. The last song on the album starts in a moment of silence. “You Speak” comes as a “fade to black” ending to this rich album. The chorus of the song echoes Mother Teresa’s famous quote “In the silence of the heart, God speaks.” It builds up to a wonderful crescendo before slowly fading out, like Jesus ascending into Heaven. Listen to this album. It is awesome. I want you to meditate on what that exactly means. Jesus is God made flesh, 100% God and 100% human. So when you look at a crucifix, realize that it’s God experiencing death. God the Son was dead. No apocalypse, no crime, and no betrayal could hurt more than the idea of God the Son suffering, bleeding, being publicly humiliated. No matter what in your life has happened to you or what you’re going through, God will understand because He experienced it. Maybe He didn’t experience it the way you specifically did, but like us, he was betrayed by someone he thought he could trust. Like us, He suffered humiliation when He did nothing wrong. Like us, He was abandoned by those he loved except for a small number of family and friends. Offer your disappointments, struggles, and pain to the Lord. He will give you rest with time. It won’t happen right away, but I can promise you that it will happen. “If today you hear His voice, harden not your hearts.” Many a Catholic identifies this as a refrain to a familiar psalm. But what is God’s voice? We can’t exactly hear it! Holy Week is a period that consists of more silence than celebration after Palm Sunday. The readings are more solemn and many people spend time meditating on Jesus’s passion and death. But how can we distinguish God’s voice from other voices, even in the silence of our hearts? It starts by knowing what God would say. 9 times out of 10, what God wants is pretty much the opposite of what the world says would make us happy. And Satan, Father of Lies that he is, tries to make us think that he is God’s voice by offering us everything we think we want on a silver platter. Today, I want you to spend time in silent meditation and I pray that you hear God’s voice during this Lenten season.